Invite the three Blessings: Health, Wealth and Good Luck! free for junior high school students and younger. Parking space 46 vehicles (M park). Initial 30 minutes is free. Parking service is available. Nagoya Sta. --› JR Chuo Line --› Ozone Sta. --› Meitetsu Seto Line --› Owariseto Sta. →Nagoya Sta. --› JR Chuo Line --› Ozone Sta. --› Meitetsu Seto Line --› Owariseto Sta. Haneda Airport International Terminal --› Keikyu Line --› Shinagawa Sta. --› JR Tokaido Shinkansen “Nozomi” --› Nagoya Sta. --› JR Chuo Line --› Ozone Sta. --› Meitetsu Seto Line --› Owariseto Sta. 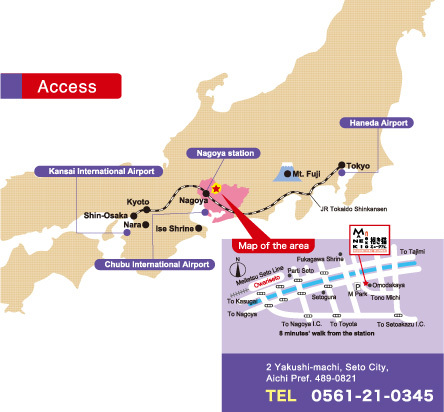 Chubu International Airport --› Meitetsu Airport Limited Express --› Kanayama Sta. --› JR Chuo Line --› Ozone Sta. --› Meitetsu Seto Line --› Owariseto Sta. 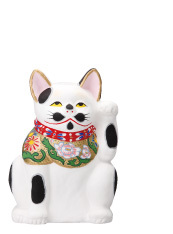 The beckoning cat, a lucky charm for inviting good luck and wealth, was born in Japan about 150 years ago during the Edo era. Generally, a beckoning cat raising its right paw is said to invite “money” and a beckoning cat raising its left paw to invite “people and customers”. It is no exaggeration to say that the beckoning cat is a traditional Japanese lucky god: it has been beloved by the common people since the Edo era. 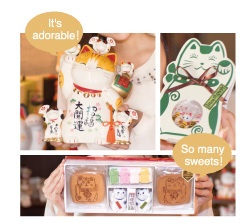 The Maneki-Neko Museum collects and exhibits about 5,000 beckoning cats from all over Japan. Since the museum is a place that invites blessing, it is filled with customers' comments like “Won the lottery”, “Found a good partner”, “Became healthy” etc... Beckoning cat lovers call the museum a “Place of Good Fortune” of beckoning cats and it has accumulated a world class collection of beckoning cats from all over Japan. A "painting experience section" where you can enjoy painting on a beckoning cat yourself. 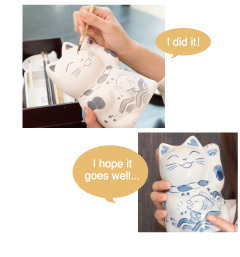 Over 10 design are ready for you, such as beckoning cat money boxes, cat shaped dishes, mugs and more. Enjoy painting with zaffer (blue paint) and create your very own beckoning cat item that will invite personal blessings to your life. I tried to paint a beckoning cat to look like my cat. It turned out great. I painted an item and gave it to my mother as a gift, she loved it. that are well suited for souvenirs, such as adorable beckoning cats and cat goods,facecloths, and incense. After painting or buying souvenirs, enjoy a relaxing moment with tea and sweets at our cafe. 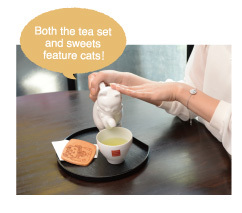 The tea is served in a beckoning cat-shaped teapot! 招き猫ミュージアム / Copyright. All Rights Reserved.